This wagon was bought new by my grandfather as a delivery wagon for his grocery store. My Uncle and Cousin restored and drove it many years before it was handed down to me. The goal for the '53 wagon is to build it in such a way that it can pull a car hauler with the Vette on it, then drive the Vette wherever we are. Ideally I would love the wagon to have a Big Block and with all the safety and creature comforts of a daily driver, yet with the torque to pull trailers. Most likely I will have to use the 350 small block and TH-350 trans that was original in my Vette. My name is Bill Overton. I am just an average guy that works for a living, but one of my passions is cars, especially the ones I have as projects. I started this website in 2002 so friends can follow my projects. I also have a Big Dog Garage group on Facebook. Feel free to post your car projects on the Big Dog Garage Facebook Group! I am also known as matchframe on several different forums. Early in my career, I worked as a broadcast video editor and matchframe is a video editing term. I call this site Big Dog Garage in honor of Annie, who we called Big Dog. Annie was a South Carolina Yellow Dog who we adopted from my brother's family. She died on Valentine's Day 2005 and is buried behind the garage. We also had three dogs that kept me company while I worked in the garage. Zora was my Husky mix who I named after Zora Duntov, father of the V-8 Corvette. Ginger was a Cocker Spaniel and is a ball of energy that never stops, who belongs to my wife. Bella was my daughter's Black Lab. I found Bella running along the freeway when she was just a pup. Zora died on 7 August 2017. Ginger drowned in the Hurricane Harvey Flood. We had to put Bella down in March 2017. We got Axle in November 2017 when he was 10 weeks old. Axle is carrying on the tradition of Garage Dog and he does it well. He is a good guard dog. His full name is Axle Grease Overton. My projects are not like what you see on TV where they begin and finish in one episode..... mine progress as I save money to work on them. This is where it began for me: in 1973 at age 15 I built a dune-buggy from a late 1950's VW chassis. The picture below shows me working on the tunnel after cutting the frame in half. I took out 18 inches to shorten the chassis. 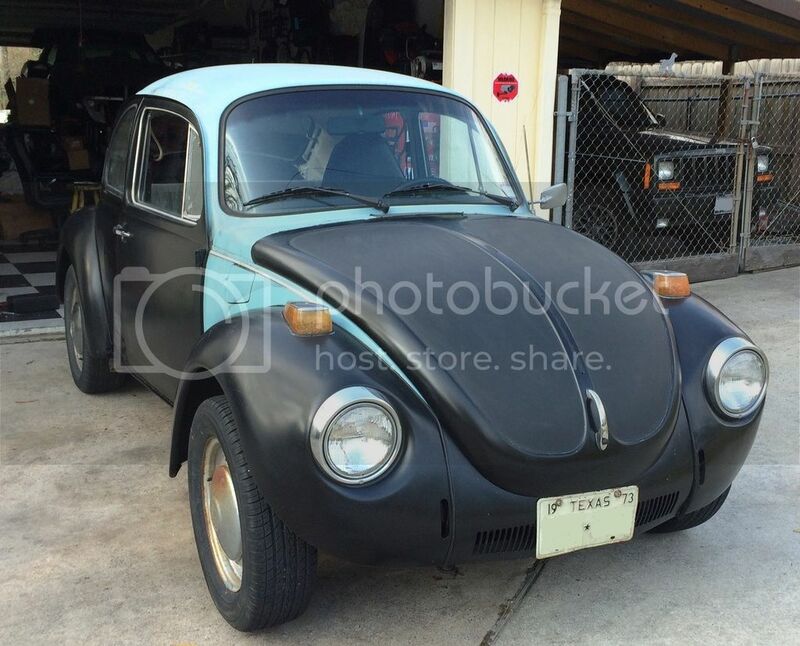 I also bought a 1965 VW Bug for the engine and transmission. My Dad and brothers all pitched in to help me complete the dune buggy before I got my drivers license a year later. I have always been fascinated with cars and when I discovered that I could build and modify them, they took on a whole different meaning. It sort of became an art form for me. I created this website to show my projects and expressions. I hope you enjoy it and maybe be able to get some good information from it for your projects. I am building it the way I think it should have been built in the first place; Big Block! The basic theme of the Vette project is Aircraft, specifically Fighter Aircraft. I love anything aviation. If I could do things in life over again, I would probably have been a pilot of some type. I have some ideas I am working with over in my mind about how to create the Vette along this theme, but know I have to be extremely careful not to cross the line into something gaudy. I have the interior sort of set in my mind on how I want to do. Hard to explain, so you will just have to wait and see how it evolves. 1973 VW Beetle was my son's first car. This is a rolling project that I drive every once in a while. The paint is a continuous process and will be complete soon. Right now I am replacing the passenger-side floor pan. Driving a stock 1973 VW Beetle on today's freeways takes a little planning ahead. The gas pedal is floored when you first see the entry ramp so that hopefully when you get to the freeway, you are at least going 50 MPH. You shift gears at redline, which in a Bug is around 4,500 RPM. Once up to speed you can hold 60 - 65 MPH but you feel like you are about to break a world record since you feel every bump and wind shift. Stopping also takes a little planning ahead. With the old drum brakes you get to stand on the pedal as the car pulls one way, then the other. When you finally get to where you are going, you feel like you have accomplished something, which you did; You actually DROVE a car. You were not a passenger in a luxury machine with all the personal creature comforts, you had the windows down so that the exhaust smell will not overtake you. There is no radio to listen to so I usually whistle. For other enjoyment, I will look down at the floor board to see the road going past through the rust holes. Gotta love really driving, it seems like a lost art, especially when you shift through the gears. 1970 and 1974 Honda CT 70 Trail Bikes. When I was young, a lot of my friends had Trail Bikes like these and I always wanted one, now I have two. The 1970 one is a CT70H model which is the manual clutch 4 speed. I still have a lot of work to do one that one. I ride the 1974 Trail Bike most afternoons when the weather is good.